It was an exciting game. The Dean E. Smith Center was a sea of Carolina blue and the men’s basketball team didn’t disappoint. 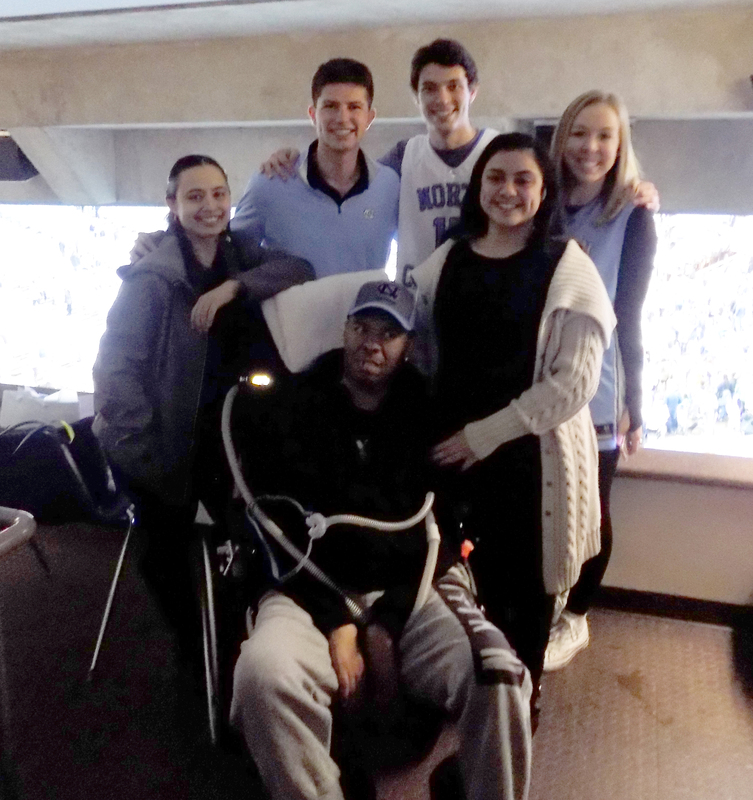 Together with more than 20,000 other fans we cheered the Tar Heels on to victory. Final score: UNC 83, Notre Dame 66. But what I was most impressed with was the family I had escorted to the game. The team leader for Transitions LifeCare’s volunteer department had arranged for four tickets from Kent Linton, founder of UNC’s DreamCatchers’ program. Accompanying me was the patient Gregg who has ALS and is essentially unable to do anything physical for himself, and his extraordinary caregivers: his wife and their eldest daughter. I met them at their home in advance of the game and saw the teamwork it takes to bring Gregg out of their home and place him in the front seat of their van. Once we arrived at the campus, we were directed to park in a parking garage. The wife and daughter team sprang into action and hoisted Gregg into his wheelchair. We took a handicap-equipped bus from the garage to the arena, unloaded, and headed up the ramp to our seats. The handicapped seat area is very well placed and gives an excellent view of the game. I asked Gregg if this brought back memories. He smiled broadly and said, “Yes!” Gregg played basketball at a Division 1 school in upstate New York. Every once in a while I glanced over at Gregg and could see him smile as he watched the game intently. Their daughter had never been to a college basketball game and was quickly enthralled by the experience. She heartily cheered for the Tar Heels and seemed thrilled to be at the game. Gregg’s wife also expressed her joy for this wonderful outing. 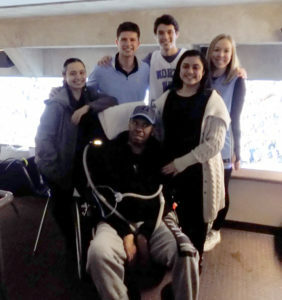 Kent and a group of his friends stopped by several times to make sure everything was in order, and even brought Gregg a gift basket that included a UNC Tar Heel hat. After the game we reversed the order – down the ramp, onto the bus, to the garage, and back home. At every juncture I saw the dynamic duo of wife and daughter, working together in fluid harmony as they navigated the various transition points. For most of us, going to a local basketball game does not take much effort. We may not even think about all it entails, but this night it was evident how important all the pieces and parts are to ensure a once-of-a-lifetime experience. From Kent and DreamCatchers to Gregg and his family to the Dean E. Smith Center and campus employees, we received outstanding help and an evening I will not soon forget. Above all, I will cherish the memory of the loving care that a wife and daughter provided for their loved one. As I got ready to leave their home, each thanked me for a wonderful evening and asked that I pass on their thanks to all who were involved in arranging this amazing experience.